WASHINGTON, D.C. -- As President Donald Trump proposes a nearly 5% increase in U.S. defense spending, 25% of Americans believe the U.S. currently spends too little on defense, while 29% stay it spends too much. Meanwhile, 43% -- the highest in 15 years -- say it spends about the right amount. The percentage believing the federal government is spending too little is down from 37% in February 2016, the last year of Barack Obama's presidency. But it is also down from 37% in 2017 and 33% in 2018 -- the first two years of Trump's presidency. See Gallup's Military and National Defense A-Z page for the full trend originating in 1969. The findings are similar when Americans are asked about the strength of U.S. national defense. 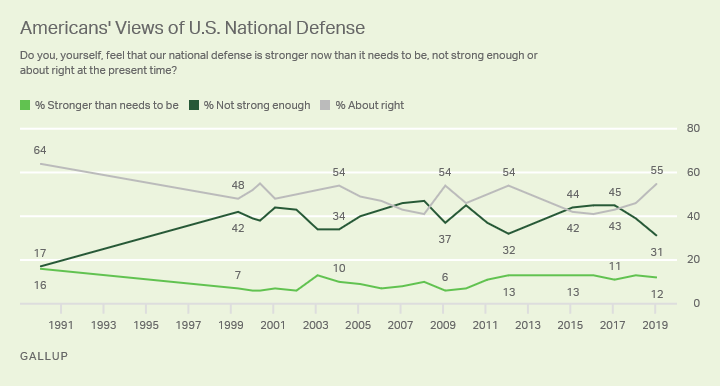 The largest segment -- 55% -- currently says the national defense is about right, while 31% believe it is not as strong as it should be. Relatively few, just 12%, say it is stronger than needed. The latest results are based on Gallup's World Affairs survey, conducted Feb. 1-10. 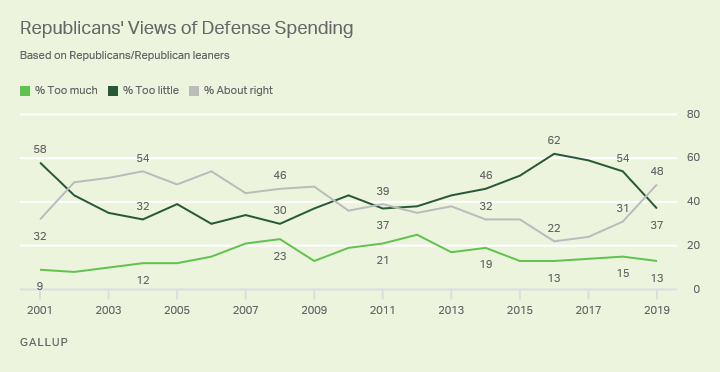 The rise in Americans' perceptions this year that the country is spending the right amount on defense stems from increases in that viewpoint among both party groups. 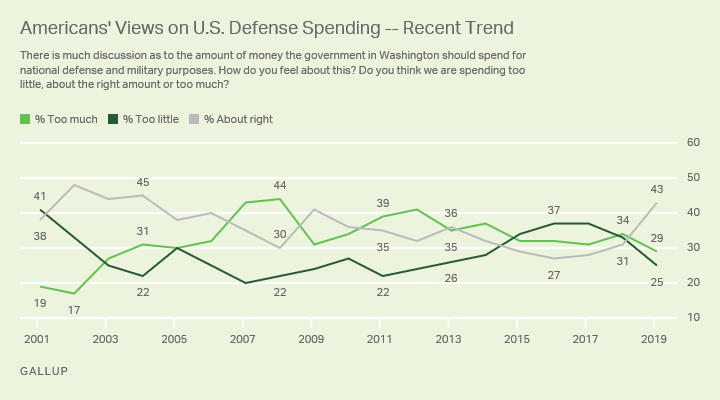 Currently, 48% of Republicans and Republican-leaning independents believe the U.S. is spending the right amount on defense, up from 31% in February 2018. This coincides with a sharp drop, from 54% last year to 37% today, in Republicans saying too little is being spent. 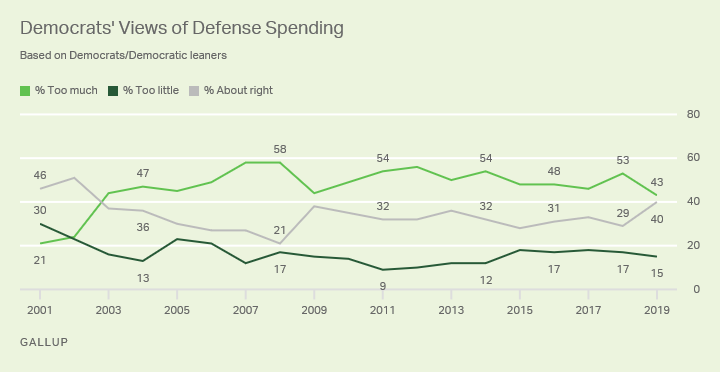 Democrats, including Democratic-leaning independents, also grew a bit more satisfied over the past year with defense spending, with slightly fewer saying too much is being spent and slightly more saying it's the right amount. Majorities of Americans say NATO should be maintained (77%) and believe that the U.N. plays a necessary role in the world (66%).